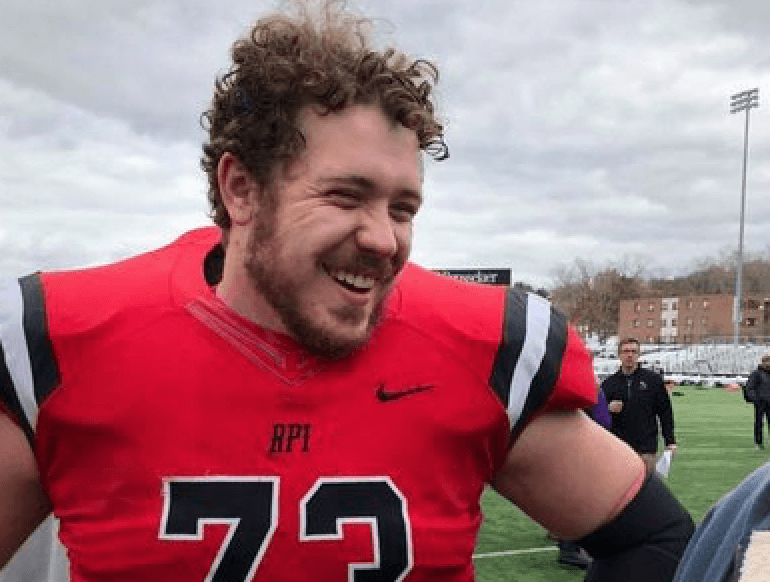 Chris Neu of RPI is an offensive tackle in college football, but he will likely convert to an offensive guard at the next level. Tell us about your hometown, and whatyou love most about it? I grew up in Mokena, Illinois, about 20minutes south of Chicago, and what I love most about it is that my entirefamily was within a 10-minute drive from each other so we would always go andhangout with family which is why I value family time so much. List these three in order of importanceand why: Film Study, Strength and Conditioning and Practice? Strengthand Conditioning, the body must be maintained day in, day out in order toachieve maximal success on the football field which is why it’s most important. Practice,the old saying goes you practice how you play which is why maximizing the mostof each practice is critical in order to have it translate to your performanceon game day. FilmStudy, being prepared before each game is essential not only physically, butmentally as well which can be achieved through countless hours of film study inorder to know what your opponents are going to do before they even do itthemselves. I only worry about things that I cancontrol in life. In football, these would be my on-field performance, physicaland mental preparation before practices and games, and my effort in the weightroom. If I were to worry things that I can’t control like the weather, therefs, the fans, etc. it would be physically and mentally exhausting leading tosub-average performances on the field. Give me an example of when you failedat something. How did you react and how did you overcome failure? I failed a computer programming classin college. I was devastated because I had never failed a class in my life, andit definitely made me think about school more seriously. I overcame it byretaking the course the following year and devoted significantly more time toit. As a result, I did leaps and bounds better and was one of the mostsuccessful students in the class. What do your teammates say is your bestquality? Who is the best player you have everplayed against in college? What would your career be if youcouldn’t play football? Room, desk, and car – which do youclean first? If there was a disaster and you couldeither save three strangers or one family member, which would you choose andwhy? One family member. I was taught at ayoung age to value family, so if anything were to happen to them that I couldcontrol, I would be devastated. I will always protect family over strangers. Michael Corleone, The Godfather. Ithink that being respected by others is more important than being liked bythem. Michael is not only respected, but in many senses feared by hiscompetition and those around him. Tell me about your biggest adversity inlife and how you’ve dealt with or overcome it? I have not had any big adversities inmy life. Sure, there are obstacles to overcome and mountains to climb, but inthe end I deal with all of them by being mentally tough and knowing that theoutcome will be what it will be. As long as I know I put in my full effort,then I am satisfied with the end result, good or bad. When I was applying to colleges, I gotrejected by my first-choice school because I forgot to submit my test scores. What was the most memorable play ofyour collegiate career? We were running outside zone away fromme, and I open up to scoop the 3-tech. The guard stays on, so I pull around himand start sprinting to the linebacker; I get my hands on him, and in theprocess run him into two other defenders knocking them down like bowling pins,and finish with a nasty pancake block. What song best describes your workethic? I don’t think that there is one songthat best defines my work ethic. What is the most important trait youcan have (Physical or Non-Physical) to help you succeed at the nextlevel? Mental toughness, it is by far the mostimportant trait any athlete can possess and often the one which is the mostunderdeveloped. There will always be hurdles to overcome in life, and it is howyou respond to them that will determine your success in life. If you could bring one person back fromthe dead for one day, who would it be and why? My grandfather, he died when I was veryyoung, and I would love to just get to know him a little bit and see what kindof person he really was. If you were to open a dance club, whatwould you name it? Who is the most overrated player in theNFL? Would you rather be liked or respected,and why? As I said earlier, I prefer to berespected. You are never going to be able to get along with everyone you crosspaths with, but earning the mutual respect of one another is the greatest honorone can bestow. Having the respect of not only teammates but competitors aswell shows your personal character which I value very much. What player who had his career derailedby off-field issues do you feel for the most and why? Josh Gordon, the mind is a verydifficult thing to control. Once it starts to wander and cause trouble, it isalmost impossible to recover without another potential relapse. He has alwayshad trouble off the field, and I hope that he eventually finds peace of mind. I definitely hate to lose. I am verycompetitive by nature, and while I do always try and enjoy the victories whenthey come, in the back of my mind I always have the defeats lingering whichjust creates more drive to succeed in my future endeavors. I do try to enjoythe successful moments when they come, but I will always know that there iswork to be done in order to replicate that success in the future. Who has been the biggest influence onyour life and explain why? I think the biggest influence in mylife has been my Dad. From a young age he instilled in me this inner drive tonever give up and never give in, and this incredible desire to put 100% effortin whatever I set out to accomplish. He also helped create this burningsensation to always improve and strive for perfection which I think has had thegreatest impact on my football career and my personal life.